Luke Donald is on course for his first victory in four years after leading the Madrid Masters by a single shot. 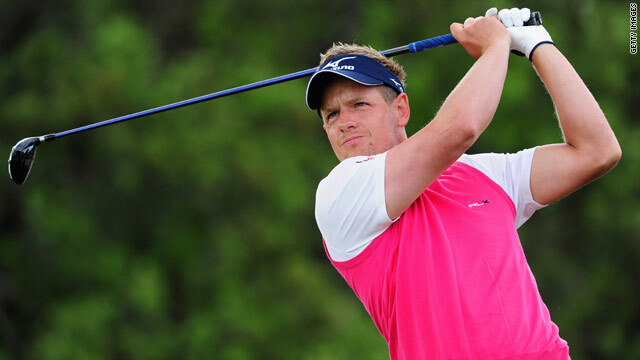 (CNN) -- Englishman Luke Donald holds a one-stroke halfway lead in the Madrid Masters on Friday after adding a five-under par 67 to his opening round 65. Donald led by a huge six strokes after reaching the turn in 31, but he three-putted the seventh and bogeyed the eigthth to let his rivals close the gap. "It's hard to play perfect golf for four days, but the two bogeys were not really bad shots and I feel like I have a lot better control with my irons this week," the 32-year-old told the official European Tour Web site. Donald came into the tournament ranked 13th in the world despite not claiming a victory anywhere for four years. Welshman Rhys Davies was level with Donald with two holes to play, but bogeyed the short 17th and goes into the final two days one stroke off the lead. "I was a little disappointed the way I finished, I thought I could have got the lead on my own, but all in all I'm not going to complain about my round," said Davies. Meanwhile, it proved a disappointing day for local favorite Sergio Garcia, who missed the halfway cut on European soil for the first time in six years.